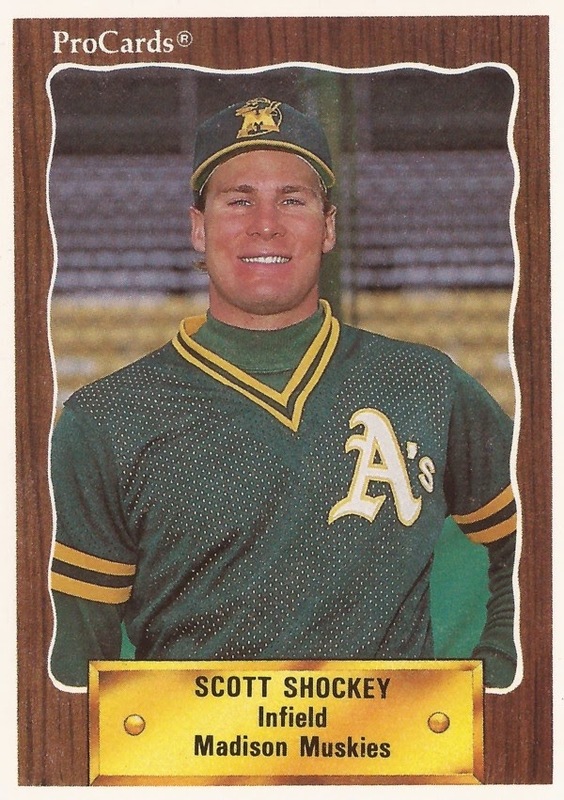 Scott Shockey made AAA Tacoma for a brief stint in 1990, but for 1991, it was back for seasoning at AA Huntsville. In 70 games for the Stars, his season hadn't been going well. He hit .240 with just four home runs. Then, it got worse, about as bad as it could, according to The Los Angeles Times. Attempting to break up a double play, Shockey's foot got stuck, his knee gave out, according to The Times. Total reconstructive surgery ended his year and made him lose out on all the next year. Doctors, The Times said, put his chances of coming back at no better than a coin flip. "You can tell someone the odds, but you can't tell how much desire they have," Shockey told The Times in 1993, playing for AAA Tacoma. "I don't like being told I can't do anything." Shockey was taken by the Athletics in the seventh round of the 1989 draft out of Pepperdine. He played that year at short-season Southern Oregon. For 1990, Shockey began at single-A Madison, hitting .261 with 10 home runs with the Muskies. One of those home runs came off a rehabing Juan Nieves May 21, according to The Milwaukee Journal. Then came high-A Modesto and an average jump to .325 and a level jump to AAA Tacoma. With the Tacoma Tigers, Shockey played 13 games, hitting .279. Then came 1991, Huntsville. On July 4, Shockey did well, hitting a triple and scoring on a sac-fly. The blown-out knee came later that summer. Surgery and rehab and Shockey was ready for 1993. While Shockey made it back, and to AAA Tacoma, he wouldn't make it to the majors. He played 21 games at Tacoma in 1993, then 28 back at Huntsville for 1994 and Shockey was done.